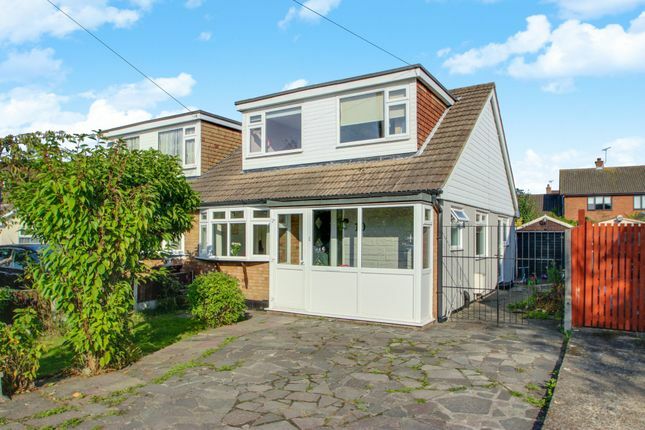 Williams & donovan are pleased to offer for sale this four bedroom chalet, situated in a popular Thundersley location close to local amenities and major routes. This property is offered for sale with no onward chain and benefits from having four bedrooms, modern fitted kitchen, ground floor bedroom one and bathroom and a rear garden measuring approx. 40'. Lounge 15' 9" x 10' 3" (4.8m x 3.12m) Skimmed ceiling. Double glazed French style doors leading to and overlooking rear garden. Radiator. Laminate wood flooring. Kitchen 11' 8" x 10' 8" (3.56m x 3.25m) Skimmed ceiling with spotlight insets. UPVC double glazed windows to rear and side aspects. Door to side. Range of base and eye level units. Roll top working surfaces. Inset one and a half bowl ceramic sink unit with mixer tap. Space for range cooker with extractor chimney over. Space and plumbing for washing machine. Space for fridge/freezer. Wooden flooring. Ground floor bedroom one 12' 7" x 10' 3" (3.84m x 3.12m) Skimmed ceiling. UPVC double glazed bow window to front aspect. Radiator. Laminate wood flooring. Ground floor bathroom Skimmed ceiling with spotlight insets. Obscure uPVC double glazed window to side aspect. Three piece suite comprising enclosed cistern w/c, vanity mounted hand wash basin with storage beneath and panelled bath with electric shower over. Heated chrome towel rail. Tiled with complimentary ceramics. Tiled floor. Bedroom two 19' 4" x 8' 6" (5.89m x 2.59m) Skimmed ceiling. UPVC double glazed window to rear aspect. Radiator. Laminate wood flooring. Bedroom three 11' 5" x 10' 7" (3.48m x 3.23m) Skimmed ceiling. UPVC double glazed window to front aspect. Radiator. Laminate flooring. Bedroom four 9' 7" x 8' 9" (2.92m x 2.67m) Skimmed ceiling. UPVC double glazed window to front aspect. Radiator. Laminate flooring. Outside of property: To the front of the property, a crazy paved driveway provides off street parking for two vehicles. Lawn area with mature trees and shrubs. Double wrought iron gates to side, providing further hard standing for off street parking and access to detached garage with up and over door. The rear garden measures approx. 40' and commences with patio area leading to lawn. Outside tap. 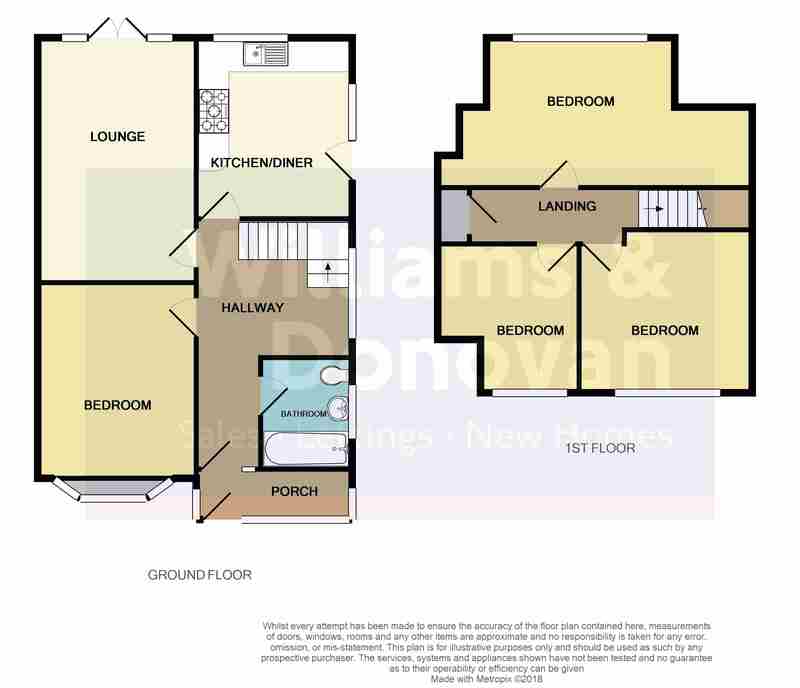 Property descriptions and related information displayed on this page, with the exclusion of Running Costs data, are marketing materials provided by Williams & Donovan, and do not constitute property particulars. Please contact Williams & Donovan for full details and further information. The Running Costs data displayed on this page are provided by PrimeLocation to give an indication of potential running costs based on various data sources. PrimeLocation does not warrant or accept any responsibility for the accuracy or completeness of the property descriptions, related information or Running Costs data provided here.